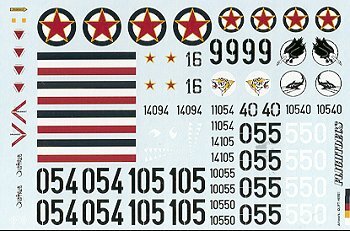 With the recent release of several good kits of 50's US jets in 1/48, it has given several the opportunity to provide sheets covering these aircraft. This is FlightDecs first sheet and is a superb initial effort. It covers aircraft used by the Yugoslav AF during the 50's and 60's. Yugoslavia leaned towards the Soviet Union as a result of Tito being backed by Moscow, but in many ways much closer to the West than other countries in the area. As a result, they basically used US aircraft in their military, similar to what NATO was or had been using. This all eventually changed as things often do and the rest is history. T-33 - overall metal finish with red wings tips and tail section, and a later version in aluminum with yellow undersides and black stripes (used as a target tug). Canadair Sabre - natural metal with unit badge on nose. F-86D - There are actually six schemes for this plane, all in natural metal. Most are pretty tame with only an aircraft number or unit badge on the nose, but one has a rather interesting black nose section with a shark mouth of sorts. The decal sheet itself is printed by Propagteam so is a know quality in terms of excellent registration and clarity. There are enough markings on the sheet to allow two aircraft to be built from it. In some cases you'll have to trim and substitute numbers for the wing and nose presentations. The instructions are superb with color given for the profiles, upper and lower views given and a very nice color chart giving FS 595 color matches. There are two things I'd like to see on upcoming sheets. First is what kits to use. This may be a no brainer to some of you, but there are two different boxings of the F-86D; one by ProModeler with no parabrake housing and one by Revell AG with the housing. 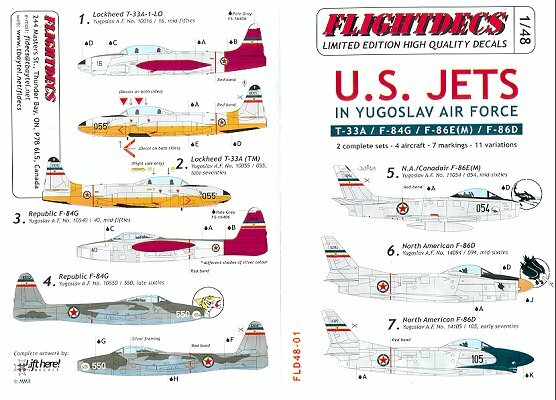 Which is correct for the Yugoslav AF F-86D's? Secondly, I'd like to see any modifications that may be needed for the kit. As an example of this, to my understanding, all NATO and European F-84Gs had the speed brake with the square sections in it and not the perforated one. If that is the case, then you can't use the Tamiya F-84G right from the box, but will have to use the ProModeler kit as it includes both variants. 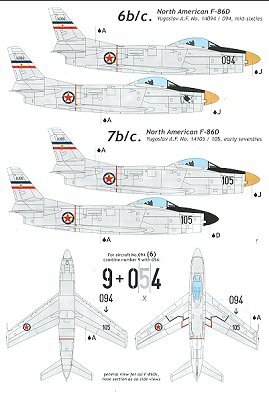 For the Canadair Sabre, which kit is best for it? Hasegawa does several F-86 kits with different wings. Do we use one of those and which one, or go with the Academy Sabre? Which is more appropriate for what the Yugoslavs used? Late note: I have been informed that the Yugoslav F-84Gs had the perforated airbrakes and the F-86s were similar to E models with the '6-3' hard wing and no wing extensions. This means that any Korean War F-86E kit by Academy or Hasegawa would be the one to use for the Sabre. Though the sheet gives very general references, most are ones that folks here in North America are probably not going to have access to so it is important that the instructions give us as much info as possible to do an accurate model. None of this detracts in any way from the quality of the decals or the usefulness of the sheet itself. If you have an interest in doing a kit that is a bit different from the others out there, then I can highly recommend this sheet. In fact, I'd very much like to see more like it as I like this type of sheet. If you want yours, you can order direct via the link below. It is a very short run sheet so get it while the getting is good! Review sheet courtesy of FlightDecs. Thanks for your support.